US First Lady Michelle Obama had a meeting this Monday morning with 10 young Cuban students where she learnt about educational experiences in Cuba, as part of the official visit to Cuba of President Barack Obama. 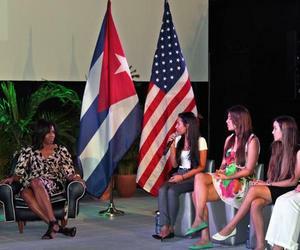 Two female students of the Saul Delgado senior high school, and others from the University of Havana, and the Higher Institute of Arts, answered questions raised by Michelle. The meeting was held at the Factory of Cuban Art cultural complex, in the center of the city, coinciding with the first anniversary of Miss Obama's Let Girls Learn initiative that aims at bringing education to over 60 million girls from all over the world.